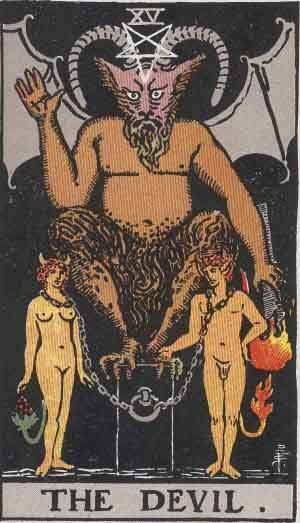 The Devil is the 15th Major Arcana card. A well known concept, The Devil is the lord of the underworld in many cultures. As a tarot card, The Devil has many meanings, as well as interesting visual symbology in the Rider-Waite illustrations. The true meanings, however, are not as frightening as the image portrayed. The Devil represents materialism, the conquest of matter of spirit, and ignorance. Past – The Devil in the Past position means that you have overcome a period of materialism, excessive fandom or addiction. You may have been really ‘into’ something, and you’ve finally escaped it. It could be anything, a TV show, a drug, a person. You were hooked on it but you got away from it. Learn to understand what made you fall into the trap of addiction and do not make the same mistake again. The Devil in the past position is a good sign, as it means it’s all behind you. Present – The Devil in the present position could mean a few things. As a tarot card, The Devil has many interpretations and has changed a lot over the years. Currently, you might be addicted to something, but you have no idea. is there something you do that you’re ashamed of? Something you wouldn’t tell anybody about? It’s time to stop. You can only grow as a person with sacrifice and willpower. You might currently feel trapped or in a situation that is ongoing and you feel like you’ll never escape. Understand that this is the present, and it won’t always be like this. Future – The Devil in the future position is not a good sign. Beware that something in future might attract you and it won’t be good for your personal growth. You might get enamoured with a person who isn’t for you, or fall into a trend that is generally detrimental. To combat it, you have to be sure of yourself, and in sound mind; think about what you want from life. Work / Education – The Devil in regards to work or education means, like the ‘present’ definition above, you might feel trapped where you are now. You can leave, but it’s your decision. Would you rather stay secure where you are, or try something new? Sometimes you can apply a new way of working to get things over with quickly. Romance – The Devil in romance means that things might be stagnating. You might even resent your partner, maybe they have an unaffordable materialism, or they’re always talking about themselves. It could be that you’ve worked out that person and you can predict every waking moment. As always you have a choice. You can try to spice things up, or you can break it off. Deep down you know which is the best for both of you. Friends – The Devil in regards to friendship could mean that things are starting to get boring. When you’re around the same people all the time, it gets weary. You hear the same jokes and anecdotes over and over. This isn’t a bad thing really. It might be a good time to spend alone and pursue a new hobby, this way, when you get back to your friends, there will be a new element of discussion. If you have very close friends, consider taking a group holiday or going on a group activity. Money – The Devil in regards to finances is not a good sign, and things may be difficult. It could also be your fault that you’re in this situation. A large or superfluous series of purchases has probably put you here. You don’t need ‘stuff’ in your life. You are you, not what you own. You can’t take it with you when you’re gone. If you’re a hoarder, just start going through your stuff and sell what you don’t want. Health – The Devil reminds you to keep upbeat, even if you’re not very well at the moment. A positive mental attitude and help even in the worst of times. Things could be much worse off. Don’t overwork yourself or get tired. Consider a diet too. A good diet involves eating pure, clean food of many colours. try to cook each meal yourself and make it colourful. Spirituality and Mentality – The Devil in spirituality is a challenging one, especially if you’re into esoteric study. You might not feel that your learning is progressing. Take a break and stay positive.Without going into specifics, certain practices are a lot easier when you’re older. Stay positive, and keep learning the theory of it. You can put it into practice later. In reverse, The Devil can suggest a coming period of freedom, especially if you have been feeling constrained recently. If there is an overbearing figure in your life, for example a controlling spouse or parent, then expect them to cool down soon. If there is a bully at school, or work, then expect people to finally overpower them. There will be a tipping of the balance in power soon. We’ve selected live tarot readers to give you a FREE 3 Minute interpretation of The Devil! Scroll through them below and pick your favorite one.